Co-founder and Chief Executive Officer (CEO) Clinc., Jason Mars. Impressed by the talents that exist within the local Information and Communications Technology (ICT) sector, one overseas based Guyanese, who has demonstrated prowess on the world stage, has committed his efforts toward the development of the sector locally. Dr Jason Mars, co-founder and Chief Executive Officer of Clinc, a company that is said to have created the world’s most sophisticated and comprehensive conversational Artificial Intelligence (A.I) platform for enterprises, has embarked on the establishment of a scholarship programme that would afford Computer Science Majors at the University of Guyana (UG) an opportunity to pursue PhD studies at the University of Michigan. Added to that, he has also began networking with local tech companies, an interaction that has led to individuals being invited to train and work on a project for the Ford Motor Company. 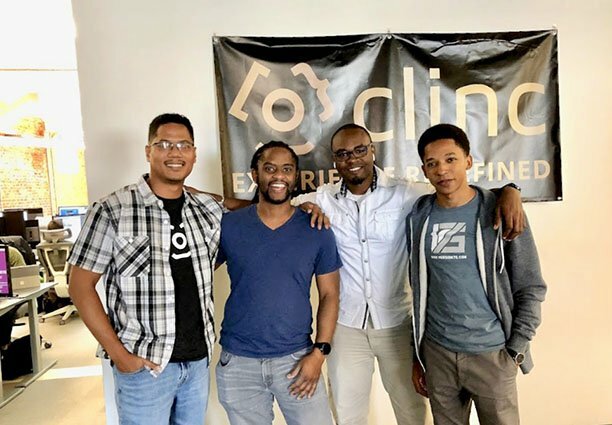 (From left) Founder and CEO of Version 75 Solutions Eldon Marks, Co-Founder and CEO of Clinc Dr Jason Mars and Version 75 Solutions team members Asa Brouet and Shemar Lindie. In a recent interview with Sunday Stabroek, Dr. Mars, born to Guyanese parents Joan and Perry Mars, explained that though he was born in Jamaica, he spent several years in Guyana before migrating to the US at the age of eight. 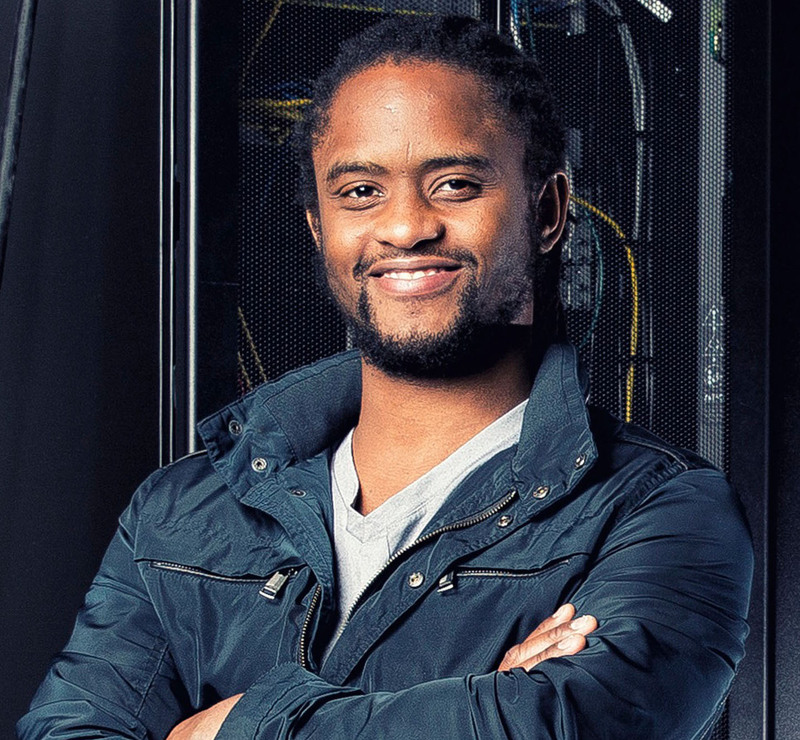 It was during his schooling in the US that his interest in computer science was sparked and later manifested into what it is right now. With a PhD in Computer Science from University of Virginia, the 35-year-old was recognized as one of the ten most innovative CEOs in banking by Bank Innovation. He is also a professor of computer science at the University of Michigan, where he directs Clarity Lab, one of the best places in the world to be trained in A.I. and system design. Prior to the University of Michigan, Dr. Mars was a professor at the University of California San Diego. He also worked at Google, Intel and IBM. Dr Mars’ work building the world’s first open-source platform for constructing large-scale A.I. and deep learning-based Intelligent Personal Assistants (IPAs) has been recognised globally and continues to have a significant impact on industry and academia. Clinc began as a research group at the University of Michigan under the name Clarity Labs Inc; a name which was later shortened to Clinc. The company was launched in July, 2015, with a mission to redefine experiences through Conversational A.I and presently has 100 plus employees, having doubled its staff only three months ago. For those who may not be entirely familiar with the term ‘Conversational AI’, it is simply software that allows interaction through conversation, such as is the case with the popular Siri, Alexa and Google Assistant. However, the technology developed by Clinc is said to be much more sophisticated. According to the CEO, the Clinc team has spent a lot of time building and growing the company and has offices in Michigan, San Francisco and London. Clinc also has customers on four continents, mostly with large enterprises in America, Canada, the United Kingdom, Turkey, and Singapore. Its success as a company thus far is mirrored in the works it has done for enterprises such as Barclays Bank in the UK, Wells Fargo, Ford and other large companies. According to Dr. Mars, while they would have placed a lot of focus on development of Conversational AI for financial institutions, they have since branched off. This decision has led to plans to re-launch the company later this year as they are able to support a number of different fields through the development of conversational A.I. for all experiences. But even with all of this going on, Dr Mars says he is still very much interested in deepening ties with the local tech sector. The CEO explained that though he left Guyana at a young age, he still sees Guyana as home and as such, he visits often and is willing to assist in whatever ways he can to help with the economic development of the tech sector here. He explained that during his last visit to Guyana in May, he met with the Vice-Chancellor of the University of Guyana and was able to select two Computer Science Majors for the Scholarship programme. “The beautiful thing about Guyana is that it has intellectual and energetic young people with fires in their belly to do good work,” Dr. Mars said, while expressing the belief that there needs to be more work in educational development in order for persons to be able to compete globally. “I saw an opportunity to bring them to do studies at a top university in America”, the CEO said. He also expressed the hope of being able to make the initiative an annual occurrence. 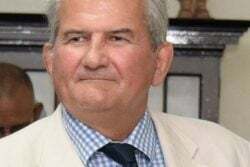 Meanwhile, Sunday Stabroek was told that while the initial plan was to select only one person, because he was truly impressed by the talent he came across, a decision was made by Dr Mars to select two persons. They are: Christopher Clarke and Roland Daynauth. Dr Mars explained that while Daynauth is expected to start later this year, Clarke will be applying at the end of summer and is expected to start early next year. Regarding the networking with local tech companies, Dr. Mars spoke highly of Version 75 Solutions (V75), a social impact focused software company in Guyana. According to Dr. Mars, he connected with Eldon Marks, CEO and Founder of Version 75 Solutions, after asking around to meet leaders in the local tech sector. Dr. Mars said he found particular interest in a V75 social impact project, for which Clinc has since offered funding. It was further explained that because Dr. Mars was so impressed with the talent he saw, he invited Marks and two of V75’s team members to Ann Arbor, Michigan to undergo competency engineer training on his company’s AI platform. According to Dr. Mars, the duo has since been assigned tasks on a project undertaken by Clinc for the Ford motor company. For his part, Marks told Sunday Stabroek that Dr Mars and his company bring “something different” to the table. He explained that while his company would have been contacted in the past by foreign companies, he found that they were more or less looking for cheap labour. This, however, is not the case with Clinc, as they have shown that they not only value the work of the local tech community, but are also genuinely interested in giving back through exposure and opportunities. Marks also confirmed that V75 team members Asa Brouet and Shemar Lindie have been assigned tasks in the completion of a project for Ford undertaken by Clinc, and he added that the men are thrilled to be working on the project, while adding that he continues to receive excellent feedback from Dr. Mars and his team. “There is so much that can be done and it’s really sad to see that the talent does not have the ability to create value for the entire world. I saw an opportunity to create an avenue for those doing computer science so those resources can be funneled into Guyana,” Dr. Mars said. “I will contribute to sparking and building the tech sector in Guyana. We are just getting started…We are excited about what we are doing and I am committed to investing in Guyana and helping to contribute to the economic development of the tech sector, so stay tuned,” he added.